Brian Thacker Travel Writer | 8 hints for a better flight. Over my years of travelling I’ve figured out a few little ways to make long-haul flights more enjoyable – from the check-in to being airborne to getting out of the airport at the other end. There are a couple in my list that aren’t quite kosher, but mostly these are some simple ways to get the most (or least) out of hurtling through the air in a giant tin can. This is somewhat of a dubious one I have to admit. I came up with this idea at Manila airport when I had arrived late for check in and there was a ridiculously long queue with only a couple of staff checking passengers in. The Business Class check in on the other hand only had one person waiting in line. I thought about it for a minute then walked straight up to the Business Class check in and said confidently, ‘Hi, my name is Brian Thacker. There should be an upgrade noted in my booking.’ When the very nice lady couldn’t find it on the booking, I said,’The same thing happened on my last flight. My publicist told me that she had organised it.’ I then huffed and puffed a bit while the very nice lady apologised then checked me in. Yes, it was into Economy, but I had bypassed the horrendous queue. I have used this technique all around the world and it has worked every single time. And even better – one time I tried it at Hong Kong airport with a Cathay Pacific flight to Melbourne and the very nice lady apologised and when she printed out my boarding pass I was surprised to see that she had upgraded me to Business Class anyway! I always take a bottle of water to the airport with just a few mouthfuls left in it. That way I’ve got something to wet my whistle while I’m checking in and then when I go through security I have an empty bottle (so don’t have to hand it over). Most airports have water fountains, so I simply fill it up. Just don’t get caught out at some airports (Denpasar Airport is one) where they have another security check at the gate. I always seem to forget and ending up buying a bottle of water for the flight after check in (there are no water fountains at Denpasar airport) then had to hand it over before I’d even opened it! Although ‘tracky’ pants would be very comfortable on a long haul flight I refuse to wear them in public. Instead I wear a baggy pair of jeans (and no, not the five sizes too big hip hop variety). That way I can stay comfortable without my – ahem – bits getting scrunched up. I always take a jacket (even when I’m heading to a hot country), because not only are planes sometimes a bit on the chilly side I can use it as an extra pillow (or if I have a window seat I stuff it in the crack against the wall to give me more room to stretch out) . I also take my own thick socks because the airline ones are often cheap, crappy ones. I try to take a shower if I can. Some airports have free showers while others you have to pay (at Nairobi airport it’s the same price of a cheap hotel room in town). At LAX there are no showers, but there is a free shuttle bus to the Hilton Hotel where there is a gym next door. You pay $10 for a casual membership and you can use the showers. The last few times that I’ve been in LAX for a longish layover I’ve even taken my gym gear and done a workout. Or, and this one may get you in trouble, you simply sneak into one of the airline lounges. I’ve done that a couple of times, too! I love Singapore airport for many reasons, but one of them is their ‘chill out’ area. It’s a big space with big bed-like bean bags and the room is dimly lit and, best of all, there are no bloody annoying flight announcements. You just set your alarm on your phone and pass out. There are a few airports around the world that have these (Abu Dhabi and Dubai also have good ones). But, if they don’t have one then I find a departure lounge area without any flights coming in (or out) then find either a few chairs to lie across or use the floor if the chairs are plastic or have armrests ( I hate that). 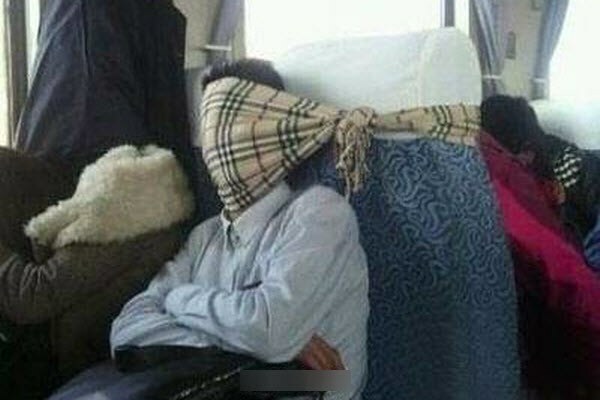 I then use my jacket as a pillow and plug in my sleep music and put on my eye mask. Oh, and I make sure that I set the alarm on my phone so I don’t miss my flight! Run. It’s that simple. 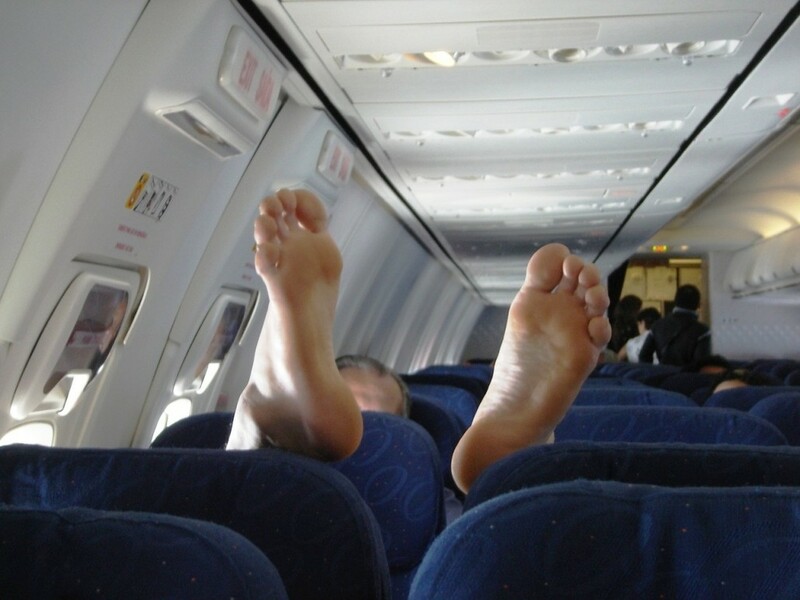 It’s often such a distance from the plane to immigration – and most people are walking in a zombified stupor anyway – that if I jog there I can pretty much pass most of the passengers – except for those pesky Business Class and First Class passengers. Besides, it loosens up your limbs!